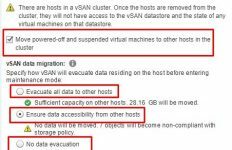 In this post we are going to continue on and talk about a VSAN Two-Node Cluster Architecture looks like. A 2-node cluster consists of two physical nodes in the same location. These hosts are usually connected to the same network switch or connected directly using network crossover cables. Use of crossover cables eliminates the need to procure and manage an expensive network switch for a 2-node cluster, which lowers costs—especially in scenarios such as remote office deployments. A third host called a “witness host” is required for a 2-node configuration to avoid “split-brain” issues when network connectivity is lost between the two physical nodes. 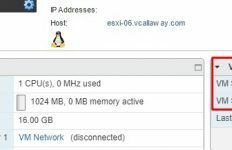 A witness host is a virtual appliance provided by VMware that runs ESXi. We will discuss the witness host virtual appliance in more detail shortly. 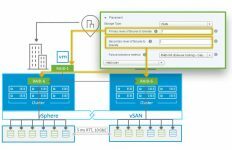 Use 2 direct connect connections for higher network availability. 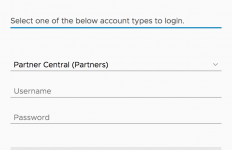 All sites can be centrally managed by one vCenter. Up to 25 VMs per site with Remote Office/Branch Licensing (at time of this post).